A Quirky Kook: Dining at the Captain's Table? The Boy is a child of troublesome tea-times. The repertoire of foods that he will accept on his plate is slowly, steadily growing from the deep, dark days when all he would entertain was fish coated in either batter or breadcrumbs but still, fish in breadcrumbs or batter is his default comfort food of choice. This one particular tea-time I popped one sole piece of The Boy's evening meal of Birds Eye Fishy Bites into my mouth... because it's a long walk from the kitchen and table, because you should never serve a child with something you won't eat yourself and because I was hungry, alright ... AND I ended up with a couple of fish bones in my mouth too. Two fish bones at the same time. @jodiekins22 Hi there, we're really sorry to see this. Please DM us your contact details and we'll be in touch. So I did. Like you do. And a couple of days later an e-mail duly arrived addressed to Ms Jodie from Birds Eye's customer service department and the delightfully named Gobad Salad. No forensic team. No small packet in the post to return, stamped Exhibit A. Not even an email saying thank you. Personally, I think that's rude. 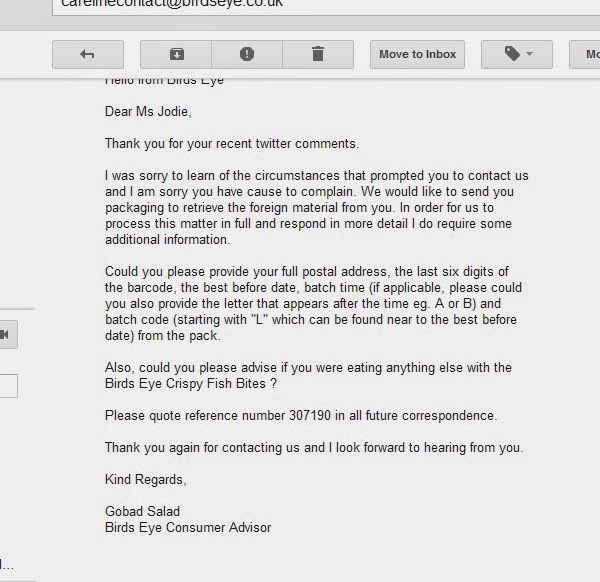 I, nearly a month after the initial Twitter exchange and not being so rude, still have a couple of fish bones and a completely useless, never going to be eaten box of Birds Eye Fishy Bites in my freezer for whenever Birds Eye feel they're ready. They must be busy right? Removing bones from fish and the like no doubt. Meanwhile The Boy is experimenting with (non-Birds Eye) Scampi.